SACRAMENTO, Calif. (CN) – After nine years of planning and 12,000 public comments, California and federal officials on Thursday released the final environmental blueprint for a $15.5 billion project to tunnel below the largest freshwater estuary on the West Coast and send water to the parched south state. Gov. Jerry Brown and planners hope to build twin 30-mile tunnels that would divert massive amounts of water around the besieged Sacramento-San Joaquin River Delta and theoretically better supply desperately dry Southern Californian cities and Central Valley farmers. Brown, a fourth-term governor whose father helped spearhead 700 miles of aqueducts and canals in the 1960s, argues it’s imperative to build the contentious tunnels in order to protect the Golden State’s dwindling water supply from climate change and other natural forces. He warns that sea-level rise could eventually turn the delta’s water brackish or that a major earthquake could shatter aqueducts and deprive Southern Californians of drinking water. “This project has been subjected to 10 years of detailed analysis and more environmental review than any other project in the history of the world. 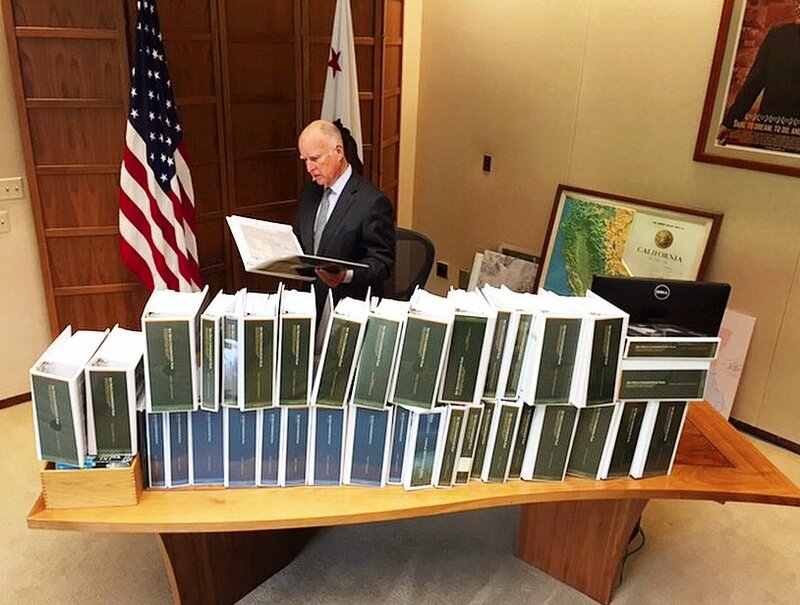 It is absolutely essential if California is to maintain a reliable water supply,” Brown said in a statement Thursday. The 90,000-page environmental impact report on the plan known as the “California WaterFix” makes the case that the enormous public works project will comply with the Endangered Species Act and environmental laws. The environmental report is the result of collaboration between the California Department of Water Resources and the U.S. Bureau of Reclamation, and must be cleared by federal regulators before construction can start. After more than 100 different concepts and designs, scientists involved with the project have arrived at the conclusion that the project-level analysis passes environmental muster and could actually improve the health of the delta’s struggling ecosystem. Protected salmon and other delta fish species have dramatically declined in recent years because of warm water temperatures and outdated pumps that gulp up juvenile fish. “The ecological problems with the current water delivery system could be greatly reduced by the construction and use of new north delta intake structures with state-of-the-art fish screens,” the report states. The project has been in the works since former Gov. Arnold Schwarzenegger was in office, and Brown has deemed it his “legacy project.” State officials hope to get federal clearance for the multibillion-dollar plumbing project as early as March. Critics and environmentalists view the project as a “water grab” for wealthy Central Valley farmers and thirsty Southern California water suppliers. The project would be funded in part by rate increases on Southern California-based Metropolitan Water District’s 25 million customers. Opponents say the California WaterFix doesn’t actually tap into a new water source and therefore doesn’t guarantee Californians and farmers more water. With the delta already overburdened by historic drought and its ancient salmon populations disappearing, they warn depriving the estuary of freshwater could be the tipping point. “Gov. Jerry Brown told the Sacramento Bee that the delta tunnels proposal is based on the best scientific thinking. That is simply not true. He left out that fish do worse with the tunnels, and that millions of delta residents will be left with degraded water that will not meet Clean Water Act standards,” the group’s executive director Barbara Barrigan-Parrilla said in a statement. Many environmentalists have suggested spending the $15.5 billion price tag on local water infrastructure projects, like wastewater capture and other recycling systems. Others believe building just one tunnel underneath the delta would suffice. The delta acts as a collection site for Northern California’s snow-fueled rivers, and it is the state’s most important water source. Since the 1960s, the State Water Project has drawn water from the Feather River into the delta where it is then pumped to the San Francisco Bay Area and the southern part of the state through canals and aqueducts. The State Water Project supplies approximately 25 million Californians and 750,000 acres of farmland, and is the nation’s largest state-built water conveyance system. But because of California’s population explosion and increased stress on the system due to a six-year drought, supporters say the State Water Project needs a makeover. The twin tunnels would protect the State Water Project from levee failures and keep brackish water from the San Francisco Bay Area from seeping into the pumps. As currently designed, the tunnels could divert 9,000 cubic feet of water per second around the delta and into the State Water Project’s maze of canals. Supporters see the tunnels as an efficient backup to southern delta pumps that could protect the state from catastrophe. If President-elect Donald Trump’s administration approves the project’s environmental reports, construction could start as soon as 2018. Brown, a staunch Democrat and environmentalist, may find an unlikely ally in Trump as the project is expected to create over 118,000 construction jobs.